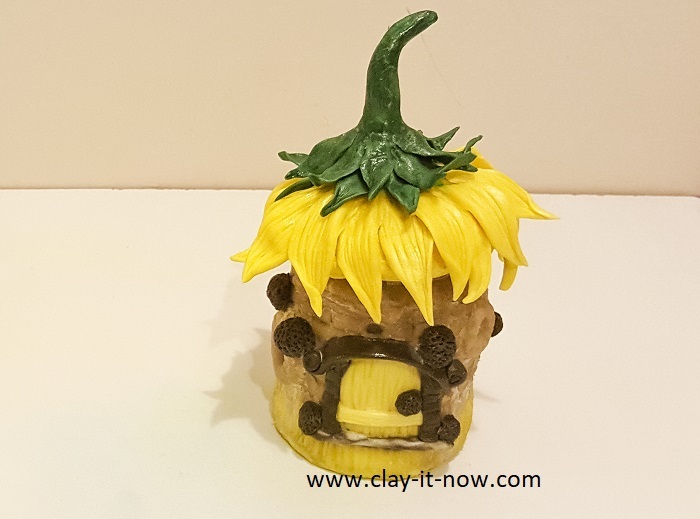 This sunflower fairy house jar looks a little bit different than the one that was previously published at Clayitnow YouTube channel. I was impatient and too excited when my fairy house done and quickly uploaded the video to share with everyone that time. So, I've added yellow watercolour paint at the bottom part of the house and green moss. Also, some glitter glue on sunflower leaves and stalks. And, I am happy with how it looks now. By the way, thank you to everyone who has commented that the sunflower looks nice and real. I was thinking about childlike style of sunflower in the beginning but then decided to make it looks like real sunflower. It's not hard to make the flower anyway. And, the best thing was... I don't need mould to make sunflower petals like this. 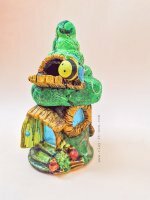 How to make sunflower fairy house jar? Step 1: form aluminium foil to shape the house and the roof, attach it to the jar with hot glue gun. Step 2: prepare your air dry clay. You can use white clay and paint it after the clay dry or use colour clay. Step 3: focus on the roof. 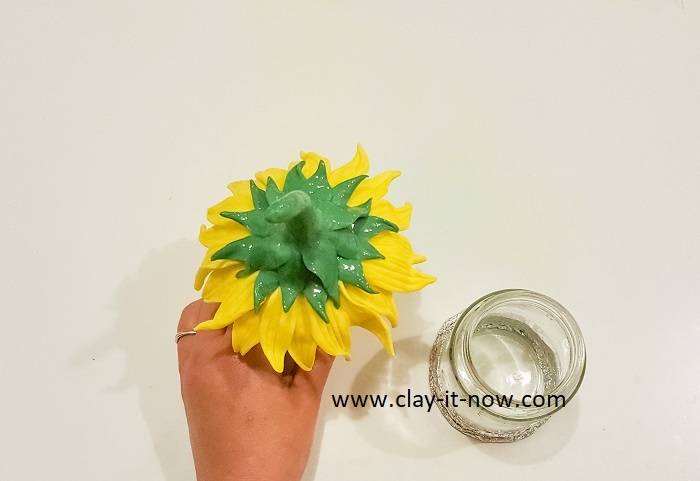 Make sunflower petals and stalk. 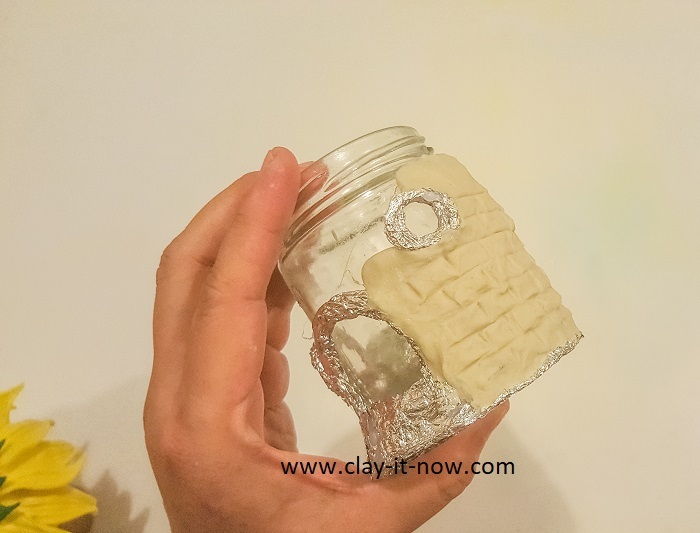 Step 4: cover the jar with clay and decorate it to your liking. Don't forget to make fairy door and windows. Step 5: Finishing touch. You can add more paints, glitter and seal the clay with varnish. You can see that this craft project won't burn your pocket. It's super cheap and yet useful and pretty. I said useful because you can use this jar as night light or table light when you put candle tea light inside the jar, fairy garden decoration, home decoration, or just to keep things inside the jar. As you can see in my video, I recycle my chilli sauce jar. Isn't it a good way to recycle and repurpose the jar? Well...you can use any type of jars you have in your kitchen. And.....you need air dry clay, of course. Any type of air dry clay would be okay. I used my own homemade clay here. I added tissue paper to my original homemade clay recipe for this project. Anyway, if you prefer to buy the clay, you can do that too. You may want to check my article on "what clay to buy" as reference if you are new to clay craft. Other materials would be aluminium foil, hot glue gun, watercolour or acrylic paints, white glue and some basic clay tools. 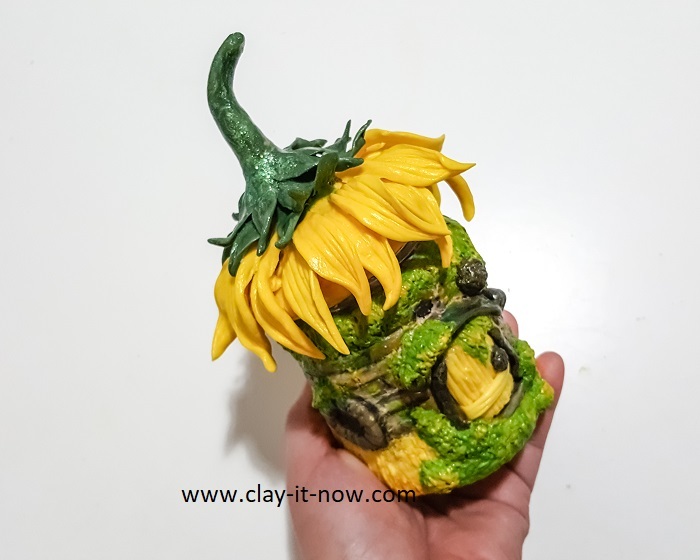 Below you'll see some of work in progress pictures and first version of sunflower fairy house jar as published on Clayitnow channel.